I know I should probably listen to a TED lecture or an edifying business podcast. But I don’t. Instead, I climb into my car and spend the 30-minute journey from Manchester to Bolton listening to comedy on the iPlayer Radio app. This does, however, mean that I always turn up to work with a smile on my face and I think that’s a good thing – particularly as I am still meeting lots of new people every day. I try and start my week with a quick run round the department, catching up with colleagues and working out what we need to get done. I’m then usually straight in to a morning of meetings to find out how we can support the other parts of the AO World. The afternoon is spent looking at numbers. We’re currently sponsoring ITV’s Britain’s Got Talent and each area of the business that benefits from the sponsorship – including brand – reports back after the show. We’re then able to adjust our activation activity accordingly to make sure we get the best value out of the sponsorship. An ideas session! I love these. AO fizzes with creative energy and it’s great fun to harness that and make it work really hard. We’re currently planning a brand campaign - that actually means preparing loads of really creative candidate ideas to explore for TV, reasons for AO to talk, and for us to demonstrate our personality. The afternoon sees me planning more strategically for the year’s activities, working with the team to determine opportunities that are aligned with our brand ambitions. I’m also trying to break a really bad habit - there’s fruit all over the place at AO, lots of it. There’s also chocolate. I took a wrong turning on day two and am trying to find my way back to the path of healthy righteousness! Lots of presentations today – fortunately I’m sitting through them rather than giving them. As the new boy, I am still meeting agencies – getting to know the wider network of partners we work with and understanding the roles they play in the AO communications ecosystem. I’ve met experiential experts who are full of ideas about events we can create and experiences we can own, digital agencies with suggestions about how we can continue to improve our digital properties and also listened to an array of ideas about sponsorship opportunities. Talking of sponsorship, I’m off to London to catch up with Freemantle, Syco and ITV about our sponsorship of Britain’s Got Talent. As part of the partnership, we will have a backstage ‘green room’ during the live shows which we’re going to fill with guests, ticket winners, suppliers, fun and the odd celeb. This, of course, takes quite a bit of organising as it’s also an opportunity to collect and create content for all our social networks. 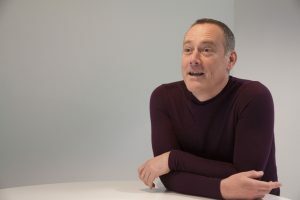 The train is also an opportunity to catch up with Andrew Kirkcaldy, Brand and People Director, away from the hustle and bustle of a lively office. Drinks after the meeting, of course, and then the train home – at least three trains later than planned! I find a quiet corner. I have loads of emails to catch up on, lots of thinking to process and the chance for a few one-to-ones with the team. And, brilliant news: the TV campaign idea has been signed off. Not so good news: I’ve just heard how soon it’s airing! A weekend of wine… I mean relaxation, in preparation for another busy week ahead.